Police were called to a minimart in Spruce Grove, Alberta, Monday afternoon after Brittany Burke and Richard Pariseau allegedly attempted to make a purchase using a stolen credit card, CTV News reported. When the cops showed up, the perps panicked, getting into an insane chase that ended with one of them somehow falling through the ceiling. As Pariseau is wrestled to the floor following another attempt to flee, Burke crawls along the duct in an attempt to reach the outside opening. 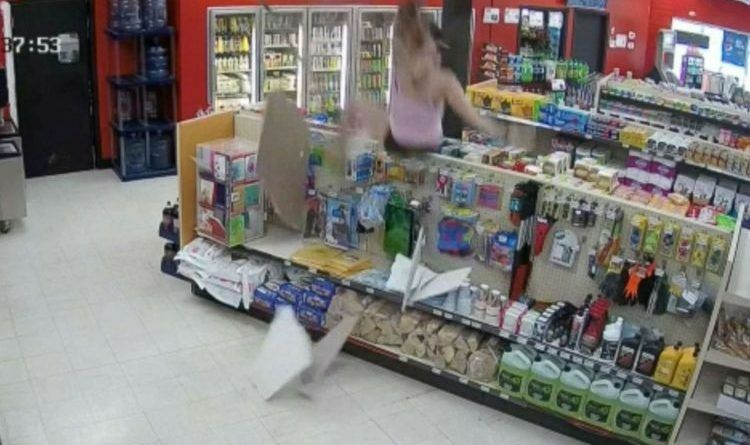 But suddenly the ceiling shatters and Burke comes tumbling into the store, slamming her body against shelves full of products. Undeterred, she jumps to her feet and tries to flee again, but is quickly arrested by the first officer and a group of Taser-carrying reinforcements. Pariseau has been charged with 11 offenses, including using a stolen credit card, resisting arrest and assaulting a police officer. Don’t judge me but my opinion is that these two are two liberal snowflakes that had nothing else to do! ← MAGA! THE LARGEST HEALTH CARE FRAUD BUST IN HISTORY WAS MADE AND THE NUMBERS ARE INSANE!